What is Apple’s MacBook Pro Touch Bar, how it works, and all the things you can do with it in macOS Sierra, first-party apps, and third-party apps. Apple’s announcement of all-new MacBook Pros today has obviously got a lot of people talking. Even if you are not in the market for a new notebook computer right now, there is little argument against the new Touch Bar being perhaps the biggest addition to Apple’s notebook lineup for a long time, and it has the ability to change the way a lot of us work on our computers. It is also perhaps the final piece in Apple’s “you don’t want a full touchscreen on a laptop” argument. We do not think we are being hyperbolic here, either. As Apple’s demonstrations and videos show, the Touch Bar, which is basically a small Retina multi-touch display that sits above the main keyboard, has the potential to change the way we do all kinds of things ranging from writing an email to working on a complex image or video. Depending on which app you have open at the time, your experience of the Touch Bar on the MacBook Pro will change, and we think that has the potential to be huge. In fact, here are examples of some of the things that can be done with the Touch Bar on the new MacBook Pro range. Browsing the web – when in Safar, the Touch Bar will give users quick access to bookmarks or even the back and home buttons. There’s even an area to tap which brings up the URL entry view. Accept and reject calls – Whether they are FaceTime or Continuity iPhone calls, being able to tap an accept or reject button just like on iOS now makes the answering of calls feel even more intuitive on the Mac. Find Locations – When in Apple Maps, icons will be displayed on the Tough Bar which, when tapped, will search for those kinds of locations. Control Music – Audio controls just got even better thanks to Touch Bar. Play, pause, skip track, etc. It’s all there. Edit pictures and videos in different photo and video apps. Ability to customize the Touch Bar. Dedicated Siri button to invoke the virtual assistant. Quick email shortcuts in Mail app. Available to use in Apple apps like Final Cut Pro X, Mail, Finder, Calendar, Numbers, Preview, Keynote, GarageBand, Messages, Pages, Photos, FaceTime, iMovie, Apple Pay, Safari, Xcode and more. Third-party app developers can make use of Apple’s APIs in macOS Sierra to extend the functionality of their apps for the Touch Bar. Apple showed off apps like Adobe Photoshop, Algoriddim djay and some others all getting support for it. 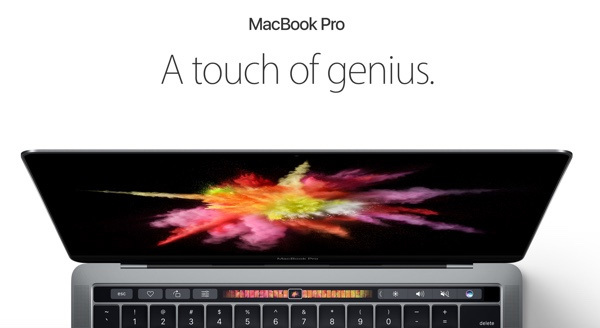 We can’t mention the Touch Bar without mentioning the inclusion of Touch ID, either. Whilst not strictly part of the Touch Bar, it’s located close enough for us to lump it in. Located at the right-most side of the Touch Bar and doubling as power button too, Touch ID on a Mac makes account authentication and quick switching a simple task, and even allows for Apple Pay authentication, too. We’ve been crying out for Touch ID on a Mac since it arrived in the iPhone 5s back in 2013. It’s great that it’s finally here. So what do you guys think? Is Touch Bar+Touch ID enough to get you excited for the new MacBook Pro? Sound off in the comments below. I decided to read this sites other blogs to see if they even offer some constructive criticism towards the new Pro, but no… You do know that you now need to move your hand away from the touchpad, or use two hands instead of just moving the mouse on screen? Even the back button on Safari, it is already a quick and amazing gesture on the touchpad. Also, you palm rejection is going to have to go to a whole new level with the even larger touchpad to get your arms on when typing. The device is nice, but as a brand new PRO model, it is the biggest disappointment from Apple in the longest time. It’s a Pro computer. That used to mean for professionals, no compromise, all the ports, all the power you could possibly have. Now it uses emoji in their promo vids, lacks even the newest generation of CPU, doesn’t use Nvidia 10xx or 9xx series, instead uses a very outdated AMD dGPU, and get rid of every port for dongles!! When clients come in, or a friend, with a USB, it is gunna be shocking when they see you need a dongle just to plug in a USB pen in a effing £1450+ laptop! Apple have lost me as a customer, loom on Reddit, they have lost loads of customers, they have lost what they once were, now they are just advertising all of their devices to everyone instead of creating the very best possible for the professional at a no compromise, high price tag kinda way. But now, emojis in a promo add for a Professional device. Surface Book 2, I am unbelievably excited to have you on my table and in my arms. Removing the headphone jack on the iPhone 7 is one thing, but removing every single port on the Macbook Pro??? I use external monitors and peripheral devices every day. I’m a wedding DJ and I need my HDMI, my thunderbolt and my USB 3.0!! I don’t want to daisy chain a ton of dongles and my power through a USB-C port. God forbid the single cable gets unplugged in the middle of a performance! Sorry, Apple but this is the first time in my lifetime I am more than happy to stick with my current Mac and skip the upgrade. Bad move this time… no lightning for the new headphones and no wat to connect an iPhone now without a new cable. This is a pro model you have to have all the ports available.